So you've decided on a Hawaiian wedding theme and now you need to find beach wedding dresses that go with your Hawaiian beach theme. Or maybe you are planning a beach style wedding elsewhere (not actually on the beach in Hawaii), wherever that may be. It's easy to bring Hawaii to any beach or even to your own back yard. And it all starts with the correct choice of Hawaiian wedding attire suitable to wear on the beach not only for yourself and your bridesmaids but the complete bridal party. Hawaii is well-known for being laid-back and casual, so why not apply the same attitudes toward your wedding? It's not uncommon for couples getting married on the beach to throw tradition to the wind and dress down. While nothing could be more romantic than a traditional Hawaiian wedding dress known as a "Holoku". The Hawaiian Holoku, a formal Hawaiian gown with a train, is also a gorgeous choice as a Hawaiian wedding gown for those who would like authentic Hawaiian wedding wear. The Holoku is an elegant, and conservative, formal tea dress, with its high neck, long sleeves, and lace. Maile, the character in Blue Hawaii who married Elvis at the end of the movie, wore a Holoku as her wedding gown as Elvis and Maile serenaded each other with the Hawaiian wedding song as they floated down a river on a canoe toward wedded bliss. A wedding on the beach does not permit you to wear those long flowing wedding gowns, with a 15ft trailing veil, they are best left for the more traditional church wedding. Hawaiian themed weddings can be more of a casual setting, allowing you set the mood for a fun relaxed day. While out in the sun with a small tent erected, you would want to wear something that matches this setting. After all a marriage ceremony is not sanctified on what beach wedding dress or gown you wear or where you get married. 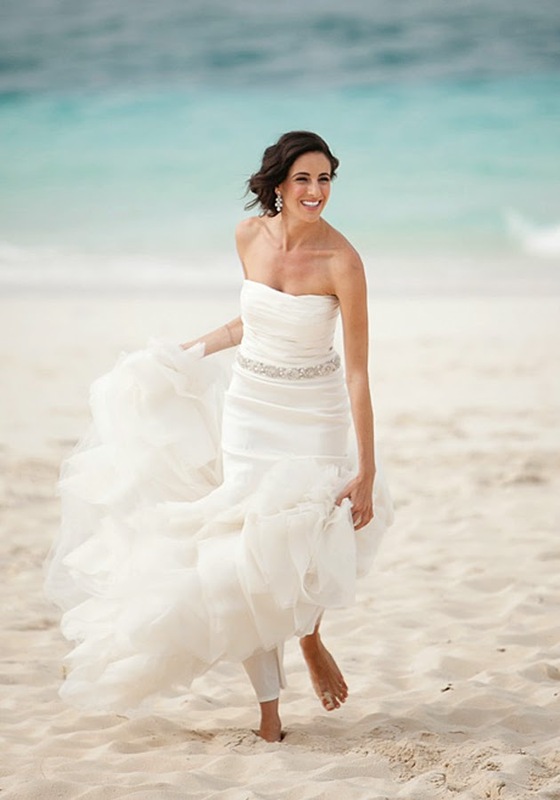 With a wedding on the beach you can be as formal or as casual as you like, they're really are no golden rules, times are simply changing giving brides the chance to truly personalize her own special day.